Though the Grand National is undoubtedly the headline act, next week’s Aintree meeting has plenty more to offer, with eye-catching renewals on each of the three days. The Grade One Aintree Hurdle is run at 2m4f and never fails to deliver. Buveur D’Air was mightily impressive in winning last year, comfortably accounting for My Tent Or Yours and The New One. Since its inception in 1976, the race has been won by some of the best hurdlers in the business. Dual Cheltenham Champion Hurdle hero, Comedy Of Errors, was a gutsy winner of the first running. The following year, Night Nurse and Monksfield dead-heated in an absolute epic. The pair were two of the all-time greats in a golden period for hurdling. Both went on to win the Champion Hurdle a couple of times apiece, with Monksfield returning to Liverpool to take the Aintree Hurdle three years in-a-row. The wonderful Irish mare, Dawn Run, captured this race soon after landing the Champion Hurdle and a couple of years before her dramatic victory in the Cheltenham Gold Cup. Morley Street became the most successful hurdler in the history of the event, winning four times from 1990 to 1993. He also landed the Champion Hurdle in 1991. Another hurdling great, Istabraq, captured the Aintree Hurdle in 1999, though failed in a thriller 12- months earlier, when losing out in a prolonged duel to Pridwell, under an inspired ride from AP McCoy. Al Eile was an Irish raider that loved both track and trip. Trained by John Queally, he achieved a trio of victories in 2005, 07 and 08. Oscar Whisky was similarly suited by the trip. Never quite quick enough to land a Champion Hurdle, he was at his best at two-and-a-half-miles. His two Aintree victories in 2011 and 2012 proved dramatic, as on both occasions he had to hold off a sustained threat from the Willie Mullins-trained Thousand Stars, each time hanging on by a neck. In a race where horses regularly return to win again, it’s hard to envisage a Buveur D’Air defeat next Thursday. Another Aintree highlight will be the Grade One Melling Chase. This is a personal favourite and has been won by Jump racing giants. Introduced in 1991, this wonderful race has gone to numerous Queen Mother Champion Chase winners. Remittance Man, Deep Sensation, Viking Flagship and Martha’s Son, all landed the big one at Cheltenham before capturing this. But it was Moscow Flyer that won over the hearts of so many National Hunt racing fans. Hugely talented, he undoubtedly had his quirks. But from being sent over fences in 2001, until the end of his 2005 campaign, Jess Harrington’s chasing superstar was virtually unbeatable. He hit the floor on occasion, but whenever Barry Geraghty was able to retain the partnership, this formidable chaser swept all-comers aside. Twice a winner of the Queen Mother Champion Chase, his win in the Tingle Creek of 2004 will live long in the memory. Then a 10-year-old, he proved himself ‘the daddy’ at two miles, when fighting off two top-class chasing youngsters in Azertyuiop and Well Chief. He travelled to Aintree to land the Melling Chase in 2004 and 2005. Undeniably one of the most talented, Moscow Flyer dominated for years. But for a period from 2012 to the end of the 2013 campaign, Sprinter Sacre surely surpassed anything that had been previously achieved over fences. Nicky Henderson’s chaser was poetry in motion. Seemingly created to jump a fence, Sprinter Sacre was as good a jumper as there’s ever been. Blessed with perfect physical attributes, he was a truly glorious sight leaping an obstacle. Destructive in the Queen Mother of 2013, he then went to Aintree and proved himself a class apart when defeating the wonderful Cue Card. Wishing to show him off to the Irish racing public, Nicky Henderson then sent Sprinter to Punchestown to win their Champion Chase. He was to return from a heart condition and famously win another Champion Chase at Cheltenham in 2016. It would be lovely to see Henderson’s latest star, Altior, compete in the Melling Chase next week. This outstanding racehorse is building a reputation to rival the likes of Sprinter Sacre and Moscow Flyer. It would be fitting if he was to match their Aintree achievements. Emotions ran high on Saturday, as Waiting Patiently maintained his perfect record over fences when capturing the Grade One Ascot Chase. The classy seven-year-old is now under the guidance of Ruth Jefferson following the death of her father. Always held in high regard, the youngster’s progress has been measured, with the team mindful of allowing the horse time to mature. They are now reaping the rewards, with the young chaser taking this step up in grade in his stride. It looked a hot renewal with Top Notch, Coney Island and the old warrior Cue Card in opposition. And it was Tizzard’s 12-year-old stable star that proved the toughest nut to crack. He was ridden aggressively by Paddy Brennan, responding bravely to the jockey’s urgings. Turning for home the pair drew clear of the field, with Waiting Patiently cruising alongside his older rival. He led at the last and stayed on strongly to win by just shy of three lengths. The pair stretched 15 lengths clear of Frodon in third, with a slightly disappointing Top Notch back in fourth. Our Duke’s odds were cut to around 8s, whilst Sizing John is a 6/1 shot. The talented novice, Presenting Percy, was runner-up in Saturday’s Gowran showpiece. It was huge performance from the youngster on just his fourth start over fences. A winner at last year’s Festival, he looks sure to go close in the RSA for which he’s now as short as 5/2. Who’d be a tipster? Things haven’t gone according to plan in recent weeks, so I’ve decided to travel across the Irish Sea (not literally) in search of a winner. The Dublin Festival at Leopardstown begins on Saturday and it’s Sunday’s Irish Gold Cup that I’ve decided to scrutinize for this week’s preview. It’s a competitive renewal though many will be disappointed not to have Sizing John and Road To Respect in the line-up. The former took this race 12 months ago prior to his successful trip to Prestbury Park, whilst the latter landed the Christmas Chase (formerly the Lexus). They’re arguably Ireland’s top two staying chasers, although many would fancy Our Duke as a potential star. Established in 1987, the first winner was the classy, if sometimes unpredictable, Forgive ‘n Forget. The 10-year-old had captured the Gold Cup at Cheltenham two years earlier but was often apt to put in an erratic round of jumping. A strong traveller through a race, when he did get it right he proved to be mighty impressive. His victory at Leopardstown in ‘87 was one such occasion. Jodami completed a hat-trick of wins in the 1990s along with a single victory in the Cheltenham Gold Cup. And at the turn of the century Florida Pearl matched that success with his own trio of wins. Trained by Willie Mullins, the horse became an Irish chasing goliath. He captured a fourth Irish Gold Cup (then the Hennessy) in his final start at the age of 12. Although never cracking Cheltenham’s Gold Cup, he did manage to land the King George at Kempton in 2001. Mullins has found it impossible to win Cheltenham’s Gold Cup but has a terrific record in Ireland’s equivalent. He landed three-in-a-row from 2011 to 2013 (bringing his total to nine), with Sir Des Champs taking the latter. Much to the trainer’s frustration, he too came up just short back at Prestbury Park when losing out to Bobs Worth. The champion trainer has two entries in Sunday’s renewal with a huge disparity in experience. Djakadam has been contesting these top-class events since 2015 and has proved wonderfully consistent. He’s won or been placed in 10 Grade One’s, though his two victories came in the John Durkan at two and-a-half miles. It would be wrong to say he isn’t effective at three miles, but he tends to find one or two a little too strong in a finish. I’d forgive him his last poor performance at Leopardstown over Christmas, when appearing to be suffering the effects of his previous clash with Sizing John. Nevertheless, on all known form he looks set to be placed at best. Mullins’ second challenger is Killultagh Vic who only has two chase outings to his name. It’s quite incredible that a horse with so little experience and having only had one outing in the past two years (that was over hurdles) can find himself second in the betting. There’s no doubting the nine-year-old is talented, but it probably says more of the doubts surrounding other contenders. I’d be astounded if he wins and of the pair I’d be siding with Djakadam. Jess Harrington trained Sizing John to win a year ago and has eight-year-old Our Duke primed for the challenge on Sunday. Ireland’s best novice chaser last year, his return in the JNwine.com was a disaster. Found to have a back issue post-race, he’s had an operation and is reportedly ready to put his best hoof forward. His Irish National success last April was mightily impressive, though he still must prove himself at the highest level against more experienced campaigners. He’s favourite for the race and needs to go close if to be considered a contender for Cheltenham’s Gold Cup in March. Gigginstown have three entered though only two are likely to challenge. Outlander and Valseur Lido certainly have the ability to go close, though the former is unpredictable whilst the latter is only recently back from injury. Outlander is four from five at Leopardstown and ran another cracker at the track when third in the Christmas Chase. He’s looked as good as ever this winter and I fancy he’ll go close. I remain to be convinced that Valseur Lido truly sees out the three-miles at this level. When part of the Mullins team, his trainer was convinced that the horse needed ‘a trip’. But he looked a certain winner approaching the last in the Lexus of 2016 before fading. Then off the track for a year, he returned to contest the same race (now known as the Christmas Chase) and again faded late-on. He’s sure to strip fitter this time and now a nine-year-old may well have the stamina required. He’s arguably the most talented horse in the field and will likely be at the head of affairs approaching the last. Many are singing the praises of Anibale Fly and it’s true he was impressive in winning the Paddy Power Chase at the track over Christmas. This is a much tougher assignment and his novice form leaves him a little shy of Our Duke. He’s only eight and there’s certainly room for further improvement, but I’m not convinced he’s quite up to this. This track doesn’t play to Minella Rocco’s strengths. It would come as no surprise to see him staying on powerfully to grab a place, but he needs a stiff finish to be seen at his best. This will serve as a warm up for Cheltenham, where I can see him again going close. I hope Our Duke wins and he may well do so. A talented novice, he’s the horse in the field that has star quality. However, there’s enough doubt for me to look elsewhere. Outlander’s record at the track is exceptional and I take him to land the spoils. Best of luck to all those having a punt. And enjoy what is set to be a sensational Dublin Festival. It’s the Dublin Racing Festival this weekend from Leopardstown with jump racing fans in for a real treat. Proposed by the racecourse and enthusiastically backed by Horse Racing Ireland, the decision to combine three stand-alone meetings into a two-day extravaganza appears a masterstroke. The festival is ideally positioned between Leopardstown’s Christmas gathering and the Cheltenham Festival in March, with the intention of attracting equine elite from Ireland and hopefully the UK. It’s fair to say that trainers this side of the Irish Sea have yet to grasp the nettle, though in years to come many are likely to add this to their winter schedule. Despite something of a UK ‘no show’, many of Ireland’s leading lights will be on duty, aiming to land prestigious prizes and further advertise their Cotswold credentials. Leopardstown tends to attract the best at this stage of the campaign. Petit Mouchoir defeated Footpad in the Irish Champion Hurdle last year. The pair are set to meet over fences this weekend in what could prove the clash of the meeting. In recent years Faugheen, Hurricane Fly, Sizing Europe, Brave Inca, Hardy Eustace and Istabraq have all landed Ireland’s showpiece hurdle. The Flogas Novice Chase (formerly Dr P.J. Moriarty) is often a target for Ireland’s best young staying chasers. Disko took last year’s renewal, defeating Our Duke and Balko Des Flos in the process. The Irish Gold Cup will be one of the highlights this weekend, having gone to Sizing John a year ago. Jess Harrington’s powerful chaser followed up at Cheltenham, though that double had not been completed since 1993 when Jodami was at the peak of his powers. Harrington has Our Duke primed for a return in Sunday’s renewal. The Deloitte Novice Hurdle also takes place on Sunday and has gone to numerous high-class performers over the years. Nichols Canyon, Vautour and Champagne Fever are recent winners, whilst Brave Inca and Istabraq also have their names engraved on a stunning roll of honour. The action starts on Saturday with the Grade One Irish Champion Hurdle the feature. The mighty Faugheen is due to run and heads the market with stable companion Melon. ‘The Machine’ is on a recovery mission after his unexplained flop last time at Leopardstown. There must be a concern as to how the ex-champ will react when put under pressure, and one wonders if time spent on the sidelines is finally catching up with him. Melon travelled like the best horse for much of the International Hurdle at Cheltenham last time, before being out-battled by the more experienced duo of My Tent Or Yours and The New One. Defi Du Seuil is set to travel over for the race and like Faugheen, needs to get his campaign back on track. Last year’s top juvenile ran a shocker on return at Ascot but is expected to show his true form on Saturday. He’ll need to go close if he’s to be considered a realistic Champion Hurdle contender back at Cheltenham in March. The Arkle Novice Chase looks a straight duel between Footpad and Petit Mouchoir. The former has a slight edge on experience and race fitness. He’s looked terrific on his two runs over fences and is a short-priced favourite for the corresponding race at Cheltenham. Henry De Bromhead’s chaser has been off the track since his impressive debut in October. You’d expect him to improve for the run and the likelihood is that he’ll come off second best this time. That may not be the case back at Prestbury Park. Another cracker on the opening day is the Grade Two Dublin Chase. Min, Special Tiara and Yorkhill are set to clash, with the latter looking to get his chasing career back on track. Undoubtedly hugely talented, this looks a mighty test for the unpredictable eight-year-old. Min is a classy racehorse and we all know what Special Tiara can do. This is a terrific renewal with plenty of questions waiting to be answered. The winner will likely endorse their position towards the head of Cheltenham’s Arkle Chase market. Sunday’s showpiece is the Irish Gold Cup, with Our Duke looking to re-establish himself as one of Ireland’s leading staying chasers. He’ll have plenty on his plate as Mullins arrives double-handed with Djakadam and Killultagh Vic. Outlander and Valseur Lido are Gigginstown’s dynamic duo, whilst Jonjo sends Minella Rocco back to Ireland. Sizing John and Road To Respect are missing, but this remains a mighty renewal. The Grade One Flogas Novice Chase also looks hugely competitive. This appears to be a strong division in Ireland with the main protagonists set to clash. Monalee and Al Boum Photo both hit the deck last time, whilst Invitation Only, Snow Falcon and Sutton Place all impressed. The Storyteller is no mug, in a race that could prove an absolute thriller. Others to watch for during the two-day spectacular are Espoir D’Allen, Samcro and Sharjah. This trio of young hurdlers all look capable of careers at the top table. This weekend’s thrilling action will tell us more. It came as something of a shock when yesterday Jess Harrington announced that her Gold Cup winner, Sizing John, would not be making the trip to Haydock for the Betfair Chase on Saturday. There’s no doubting that the trainer has Sizing John’s well-being at heart. Nevertheless, her decision goes against the wishes of the late Alan Potts, who had targeted the £1million bonus offered by the Jockey Club for a horse winning the Betfair Chase, the King George and the Cheltenham Gold Cup, in the same season. It’s hard to imagine that Alan Potts was solely driven by the thought of a million, but rather by the chance of creating a piece of history in emulating the achievement of the mighty Kauto Star. Just a couple of days back, Harrington spoke of racecourse gallops, and of having the horse ‘as fit as I can have him’ prior to the trip over. Sizing John has won eight times under rules, with half of those victories coming on testing ground. His first attempt at three-miles came when winning the Irish Gold Cup in challenging conditions at Leopardstown. Those committing to a Haydock trip in November tend to know what to expect, with the last five Betfair Chase renewals being run on soft or heavy. Fans and punters will be disappointed by the decision, and the withdrawal certainly leaves the race looking a little threadbare on quality. Though the ground is likely to be better for the King George at Christmas, there must now be doubt over Sizing John’s participation in Kempton’s showpiece. The likelihood of the Gold Cup winner staying home throughout the winter has greatly increased since Harrington’s other high-class chaser Our Duke, is now on sick leave. He’s recovering from an operation on his back, and will likely be out until February, leaving an opening for a Harrington contender in the Lexus Chase at Leopardstown over Christmas. With the headline act missing, Colin Tizzard will be far more optimistic that Cue Card can add a fourth Betfair Chase to his CV. Lightning rarely strikes twice in the same place, yet a victory for the stable star on Saturday would surely spark scenes reminiscent of those witnessed in 2011. Back then it was Kauto Star, also as an 11-year-old, that captured his fourth Betfair having been dismissed by many as on the wane. Those that were there will never forget the emotional return to the winner’s enclosure. Last year’s Betfair Chase victory came on heavy ground, and arguably his best performance of last season came in testing conditions when romping home in the Ascot Chase. There’s little doubt that Cue Card now operates as well as any staying chaser when the mud is flying. Harry Cobden is tasked with keeping tabs on race favourite Bristol De Mai, who seems likely to be ridden positively by Daryl Jacob. The Nigel Twiston-Davies trained seven-year-old also thrives in the prevailing conditions and is unbeaten at Haydock. In his two outings at the Lancashire track, he has won by a combined 54 lengths. He was mightily impressive in the Grade Two Peter Marsh Chase back in January, when cruising to a 22-length success as those around him floundered in the mud. Cue Card will be a much tougher nut to crack, but BDM looks a beast when conditions suit. Despite the disappointment of a Sizing John no show, the sight of the old warrior pursuing the young pretender should still have pulses racing come Saturday afternoon. It’s tough not to feel a little let down by the latest Breeders’ Cup. Concerns over the tightness of the track prior to racing appeared justified, as luck played a far too significant role in the outcome of several races. A fast break from the stalls became crucial, especially for those drawn on the wide outside. The racing did prove dramatic, though hard-luck stories became the norm, with many high-profile thoroughbreds running no sort of race. Gun Runner certainly did run his race. The Steve Asmusson-trained four-year-old led the Breeders’ Cup Classic from the off and stayed-on powerfully to beat a pair of Bob Baffert trained colts. Last year’s star Arrogate failed to spark, starting slowly and finishing a good half-dozen lengths adrift. The Breeders’ Cup Turf went to Europe once again, though not to last year’s winner Highland Reel. O’Brien’s colt put in another solid performance in running a close third, though it was the Andre Fabre-trained Talismanic that ran-out an impressive winner. He got the better of Chad Brown’s Beach Patrol in an exciting three-way go for the line. The Mile Turf went to American favourite World Approval. Few sob-stories here to be fair, as the favourite pulled away from the pack for a stylish success. Lancaster Bomber finished well for second, with Ribchester a little one-paced back in fifth. There was more European success in the Filly & Mare Turf, with Godolphin’s Wuheida defeating O’Brien’s Rhododendron. The winner received a ‘Peach of a ride’ from William Buick, but the runner-up looked a little unfortunate. Pinned on the rail, Moore found a gap a little too late to catch the winner. Queen’s Trust was another who had a luckless passage. No room, no gaps, no chance. She flew home when Dettori finally found daylight, but the bird had long-since flown. Frustration in America was mirrored in the UK and Ireland, with several high-profile jumpers fluffing their lines, and yet more concerns over the troubled Coneygree. The Charlie Hall clash at Wetherby between Cue Card and Coneygree failed to materialize. The low sun was blamed for the latter’s jumping error which caused his latest injury. Thankfully he looks likely to be back in action sooner rather than later, with Newbury in early December still a possibility. It was only his fifth run over fences, and a brave decision from Harrington to take on such experienced campaigners at this point in his development. It was left to the Gigginstown pair of Outlander and Road To Respect to fight out the finish, with Gordon Elliott’s nine-year-old bouncing back to form for the win. The Lexus Chase at Christmas will be a target for both, and a chance for Our Duke to bounce back to form. With something of a lull on the Flat this week, there’s been news in the past few days, regarding some of Jump racings star performers. The 2015 Gold Cup winner, Coneygree, looks set to be back in action in the coming weeks. Listowel’s Kerry National is the intended starting point for Sara Bradstock’s exciting chaser, and he appears to be giving the right signals as connections hope for an uninterrupted campaign. “He'll come on for the run, but he's fit enough as we've got our all-weather and he goes to Paul Cole's all-weather as well,” said Bradstock. The plan is to then go for the Ladbrokes Trophy (formerly The Hennessy) at Newbury in December, where he’ll be lumping top-weight and attempting to replicate the likes of Denman. The Kerry National is very much a trial for Newbury, and will give the trainer the chance to assess whether he can give huge amounts of weight away in a handicap successfully. The team prefer the flat galloping track at Newbury, over the tighter course of Haydock which holds the Betfair Chase. They will also be keen to space his races well, as they attempt to avoid injury with the likeable chaser. One that will be heading to Haydock for their Grade One feature at the end of November, is the current Gold Cup Champ, Sizing John. Jess Harrington spoke recently of targets for her leading chasers, and will be doing her best to keep Irish Grand National winner Our Duke and Sizing John apart, at least until a possible clash at Cheltenham in March. Formerly a high-class two-mile chaser, he certainly has the necessary ‘zip’ for tracks such as Haydock and Kempton, and has proved himself adept to going left or right-handed. That’s likely to ensure an Irish campaign for Our Duke prior to Cheltenham in March, with the Lexus Chase over Christmas an early objective. “Our Duke is back trotting and looks fantastic,” added Harrington. 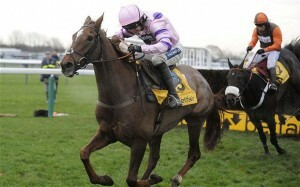 “We'll kick off his season at Down Royal (JNwine.com Chase). That looks the ideal starting point for him.” The first Grade One in the Irish National Hunt season went to Don Cossack in 2015, and the great Kauto Star in 2008 and 2010. Our Duke is likely to clash with several talented chasers from the Willie Mullins yard, including Djakadam, who came close to defeating Sizing John in the Punchestown Gold Cup in April. It’ll also be interesting to see where the likes of Minella Rocco and Native River head during the winter. The Lexus Chase could prove an ideal target for both as they build towards a possible crack at the Grand National at Aintree. There’s still plenty of action to come on the Flat over the coming months, but it’s difficult not to get excited as another National Hunt season draws ever closer. To Fairyhouse we go for today’s preview, as I put Monday's Irish Grand National under focus. I was tempted to look at the All-Weather Championships from Lingfield. But there’s a huge story developing in Ireland, and unless Willie Mullins has a fabulous Fairyhouse, followed by a pulsating Punchestown, we will have ourselves a new King of Irish Jump racing. A victory in Monday’s showpiece for Gordon Elliott could prove the killer-blow, with the race now the richest in the Irish Jump racing calendar. There is €500,000 in the prize fund, with €270,000 going to the winner. A maximum field of 30 may well contain half a dozen of Elliott’s squad, which must be a concern for the master of Closutton, who could have just two or three making the cut. Elliott’s Bless The Wings came within a short-head of winning the race 12 months ago, when just failing to catch the Gigginstown owned Rogue Angel. The same silks were carried to victory a year earlier, when Thunder And Roses took the race for Sandra Hughes. Elliott has a glut of Gigginstown contenders this time round, as Michael O’Leary looks for the hat-trick. The trends point to a lightly raced winner. Seven and eight-year-olds have the dominant record in the 3m5f marathon, with seven of the last 10 renewals going to the age group. However, the roll of honour is peppered with nine, 10 and 11-year-old victors, and they should not be dismissed out-of-hand. As with Aintree, weight carrying is a major factor in success or failure. Even more pronounced than at Liverpool, a horse needs to be carrying less than 11 stone to win this race. Commanche Court was the last horse to carry more to victory, when winning in 2000, and he went on to finish runner-up to Best Mate in the Gold Cup a couple of years later. Those rated in the low to mid-130s have been particularly successful in recent times, though that type of mark may miss the cut this year. Gordon Elliott’s Lord Scoundrel is set to land top-weight of 11-10 when final declarations are announced this morning. He’s a talented young chaser who will appreciate the sounder surface. He took the Galway Plate back in July, but has been off the track since November, and that’s hardly the ideal prep for this. Noble Endeavour and Clarcam follow-on for Elliott, with the former capable of going well off a huge weight. He’ll also enjoy the ground, and arrives off the back of a cracking effort at Cheltenham, when third to Un Temps Pour Tout. The favourite for the race is Jess Harrington’s novice, Our Duke. He’s a class act, and I’m a little surprised that he is heading here. He dodged Cheltenham, with connections saying that they wanted to ‘look after him’ with his future in mind. He’s only run three times over fences, and though the race tends do favour a novice, he is exceptionally inexperienced for this. He’s a horse I like a lot, but at this stage of his career I’d be stunned if he wins. Robbie Power can do no wrong, and he’ll take the ride, with the betting suggesting punters are confident of a huge run. Thunder And Roses only got as far as the ninth fence at Aintree, and may remain fresh enough to do himself justice. He likes Fairyhouse, though did underperform in this race last year. Now with Mouse Morris, he’s just about on a handicap mark that would give him an each-way squeak. Tiger Roll is another of the Gigginstown battalion that has an each-way chance. He was sensational at Cheltenham when winning the four-miler, and decent ground is crucial to his chances. He sauntered to victory in the Munster National back in October, and is arguably Elliott’s best shot at success. All the above lie a little higher in the handicap than ideal, and there’s several from the bottom-end that appeal. Though Willie Mullins may only have a few making the start, Haymount is one that looks to have a huge chance. Another that needs decent ground, he ran well in the four-miler at Cheltenham despite being keen throughout. He doesn’t lack gears, having beat Coney Island and Mall Dini earlier in the season at 2m4f. He’s a consistent sort, and I fancy he’ll go close. Mall Dini is another with a shout, and has the right kind of profile. He was perhaps a little unfortunate at Cheltenham last time, when hampered late-on in the Fulke Walwyn Chase. He’s as short as 8/1 for this, though I’m not sure he warrants being half the price of Tiger Roll and Haymount. Nevertheless, he’s likely to go well despite still being a maiden over fences. Abolitionist is another from the lower end of the handicap that has been attracting attention. Trained in County Kilkenny by Ellmarie Holden, this would be something of a fairy-tale success. Leading novice Rachael Blackmore takes the ride, and the horse tuned-up for this with a gutsy win in the Leinster National at Naas. The nine-year-old looks a thorough stayer, and is ideally weighted. I’m a huge fan of Our Duke, and if he runs well I’ll be thrilled, but I can’t have him for this at 5/1. Mullins versus Elliott will remain the theme for the remainder of the season, and there’s every chance that they’ll be battling it out for this valuable prize. I’m keen on Haymount and Tiger Roll, and will be backing both. Best of luck to all those having a punt. An undoubted star of the three-day Aintree meeting, was Ireland’s Robbie Power. It’s proved to be an incredible period for the popular jockey, yet he looked set to miss much of it, when struck down by a serious looking back injury at the end of January. At first, his participation in the Cheltenham Festival seemed in doubt, but thankfully Power was back in action in no time, and onboard Sizing John, when the young chaser advertised his Gold Cup credentials, in the Irish version at Leopardstown in February. Several weeks later, the jockey arrived at Cheltenham in his role as Jess Harrington’s number one, and captured the main prize. Sizing John was part of a treble during a thrilling Festival, with Supasundae taking the Coral Cup, and Rock The World winning the Grand Annual. The victory in the Gold Cup for owners Ann and Alan Potts secured the jockey his spot as retained rider, and he certainly made the most of it at Aintree. Sporting the famous green, yellow and red silks, Power made a huge impact at Liverpool for trainer Colin Tizzard, first causing an upset on Pingshou in the Grade 1 Top Novices’ Hurdle. The seven-year-old had finished down the field in the Supreme, but bounced back to form with a four-length success over Malcolm Jefferson’s talented youngster, Mount Mews. He galloped powerfully to the line, and looks to have the stature to make a nice chaser next season. Power then had a dream ride on the impressive Fox Norton. He ran-away with the Melling Chase, thrashing Sub Lieutenant in the process. He’d only just failed to land the Champion Chase at Cheltenham, and this step-up in trip appeared to suit. Tizzard’s chaser looks to be progressing at a rate-of-knots, and may well be one for the King George next Christmas, with the owners having Sizing John for the Lexus Chase in Ireland. Power may have to forego the Turkey and Christmas pud. Sizing Codelco was something of a bonus on Saturday, but Finian’s Oscar looks the real deal. The jockey had the opposition covered turning for home in the Grade 1 Mersey Novices’ Hurdle, and the five-year-old stayed on powerfully for a three-length success. There’s every chance he’ll be sent over the larger obstacles next season, with Power then having the prospect of riding Finian’s, Foxy and Sizing John. He must be licking his lips in anticipation. Arguably his greatest achievement in the saddle, was riding Silver Birch to victory in the Grand National of 2007. The son of an Irish show-jumper, he became champion conditional jockey in 2004, and though better known for success in Ireland, he did partner Boston’s Angel to victory in the RSA at the Cheltenham Festival of 2011 for Jess Harrington. His top-level victories on home soil have been numerous, and include Grade 1s on Jezki, Big Zeb, Oscars Well, and twice on Boston’s Angel. He also partnered the Harrington trained Our Duke to victory in a Grade 1 chase at Leopardstown over Christmas. It’s this staying chaser, not risked at Cheltenham, that could prove a realistic challenger to Sizing John next season. Power will hope that the pair can be kept apart during the winter, though a clash looks inevitable at some stage, with Our Duke appearing to be this year’s outstanding staying novice in Ireland. The man from Meath has Fairyhouse and the Punchestown Festival still to look forward to, before a well-earned summer break. He’ll then be counting down the days, desperate to get back aboard several of the best horses in training, and dreaming of yet another winter to remember. Native River proved far too classy for his rivals in the Denman Chase, and heads to Cheltenham as a leading contender for the Gold Cup. Regular pilot Richard Johnson, was struck down with the flu, but ‘supersub’ Aidan Coleman followed the pre-race plan to perfection, and Tizzard’s young chaser controlled the race from start to finish. In both the Hennessy and the Welsh National, Native River was ‘hanging-on’ a little at the finish, hence a slightly more conservative approach was tested, with Coleman stepping on the gas later in the race. Native River responded stylishly, scooting clear of Le Mercurey, and the slightly disappointing Bristol De Mai. The trainer’s day improved considerably, with Ballyandy landing the valuable Betfair Hurdle in a thrilling finish. The race turned into a head-to-head with Movewiththetimes, and as the pair pulled clear heading for the last both jockeys waited for the moment to strike. And it was Sam Twiston-Davies that came off best, as his partner had a little more zip than Barry Geraghty’s. It’s impossible to review Newbury without mentioning Nicky Henderson’s latest star, Altior. He took on more experienced chasers in the Game Spirit, and duly demolished them. Allowed to stride-out in front by Nico De Boinville, the young chaser was scintillating at his fences, and powered clear down the home straight. The finishing time was impressive, and it’s hard to imagine anything getting close when he heads for the Arkle at Cheltenham. Fox Norton ran with great credit on his return from injury, and may be the one to give Douvan a race in the Champion Chase next month. Yesterday at Leopardstown, Sizing John stepped out from the shadows of Douvan, to capture the Irish Gold Cup. Up in trip, he travelled like a dream and stayed on powerfully to stave off a pair of Gigginstown chasers, and probably book his place in the Gold Cup at Cheltenham. “He was brilliant,” said a thrilled Jess Harrington. “It's fantastic to have a horse like that for Alan and Ann (Potts, the owners), who has finished so close to Douvan on many occasions. That was his first time over three miles and he jumped, travelled and did everything we had hoped he would. Once he went past two and a half miles we knew he was into unknown territory, but we fully expected he would stay three miles and he did. “I'd say we'll be going for the Gold Cup. I don't know, as I haven't spoken to Alan and Ann yet,” Harrington added. The likely clash with Tizzard’s trio will no doubt prove an interesting and probably amusing talking point, for connections and trainers as the ‘big day’ approaches, with the Potts’ now such high-profile patrons at the Dorset stable. There’s likely to be a fair amount of movement in the Gold Cup and Ryanair markets over the weekend, with top-class action on either side of the Irish Sea. At Newbury on Saturday we have the Grade 2 Denman Chase. Run at a shade under three miles, the race was established in 2000 and won by the Paul Nicholls trained See More Business. He was then a 10-year-old and had already captured the Gold Cup and the King George (twice). Nicholls has a fabulous record in the event, having won half of the 16 contested. His winners in 2006 and 2007 are modern day greats of the sport, in Denman and Kauto Star. Both went on to win the Cheltenham Gold Cup a month after victory here. Kauto was of course famed for his incredible record in the King George, whilst Denman became a Newbury hero, winning the Hennessy Gold Cup in 2007 and 2009. A theme of Gold Cup and King George winners capturing this event has carried on in recent years, with Long Run, Silviniaco Conti and Coneygree adding their names to a stunning roll of honour. A small field is likely to assemble for Saturday’s renewal, with a clash of rising stars eagerly anticipated. Native River certainly enjoyed his last visit to the track, when winning the Hennessy in November. He also won a novice chase over course and distance in 2016, and is currently second-favourite for the Gold Cup in March. The main threat on Saturday appears to be the recent Peter Marsh winner Bristol De Mai. That devastating success at Haydock prompted Twiston-Davies to target the Gold Cup, and he will hope to build on that stunning display at Newbury. Testing ground brings out the best in the six-year-old, and he is likely to have his optimum conditions this weekend. Paul Nicholls will hope that he can add to his incredible haul, with the French-bred seven-year-old Le Mercurey. He’s always looked a horse capable of a huge performance, though so far over fences has fallen just short of the best in the division. He chased home Many Clouds at Aintree back in December, and cannot be discounted, though the market leaders certainly appear a cut-above. There’s four Grade 1s at Leopardstown on Sunday, with the Irish Gold Cup Chase the feature. A prestigious event in its own right, the race is often used by those testing Gold Cup credentials. Jodami and Imperial Call won this before heading to victory at Prestbury Park. Florida Pearl and Beef Or Salmon were prolific winners of the Leopardstown feature, but both failed in attempts to capture the main prize at Cheltenham. The latter came fourth to Best Mate in 2004, whilst Florida Pearl came closer when runner-up to Looks Like Trouble in 2000. Carlingford Lough has won the last two renewals, but has proved disappointing at Cheltenham. He’s back to defend his crown, though is likely to face stiff opposition from several less exposed types. Don Poli looked rejuvenated when second in the Lexus Chase at Christmas, and Gordon Elliott will be hoping for more of the same. Third in last year’s Gold Cup at Cheltenham, the target appears to be the Grand National, though a strong run here would likely see him head to the Cotswolds in March.